Thank you for all the birthday wishes! I had a great few days off with my mom and the husband. Mom just left to go back home to California, which means I have to go back to real life….cooking dinner and doing the dishes instead of hanging out and decorating my house. I had such a great time with her…it is always sad to see her go. 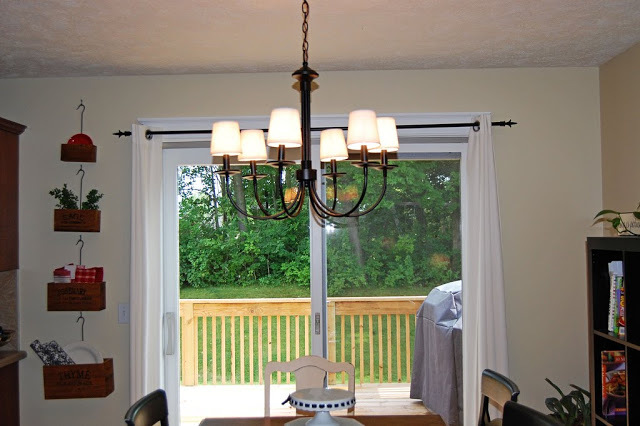 Since my mom is really handy I always put her to work when she visits.One of the projects she helped out with was replacing the ugly chandelier in my dining room. I have hated that chandelier since we moved in! Here is the before. Ugly. Totally not my style. Another shot. 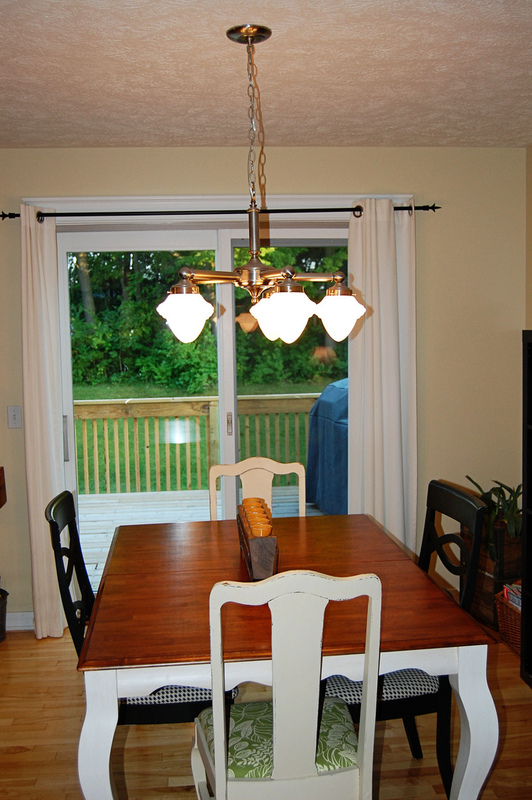 Please ignore the mismatched chairs…I’m working on fixing that problem too…one project at a time. Ta da! Isn’t it beautiful? And it fits in so much better with the decor in my house. It only took about a hour to install….and of course the husband lended his muscles to the cause too. (Holding that chandelier above your head gets heavy!). I did most of the wiring and my mom was the brains of the operation. When we were finished and the husband went to turn the power back on I got a little nervous…so I made sure our fire extinguisher was handy…just in case. Needless to say we didn’t need it! 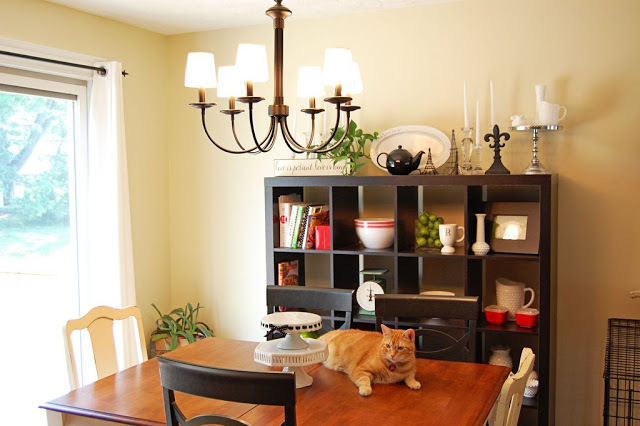 View of the dining room now….with Pancake. Much better right? The chandelier and mini shades are all from Lowes. 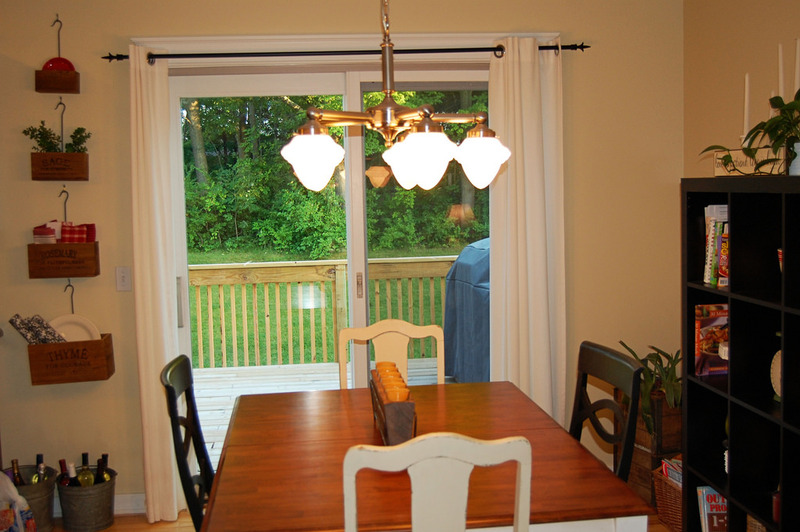 The next day my mom installed a dimmer switch for the chandelier….so we can have some romantic lighting. It was really easy to install….but I mostly watched. Thanks for all your help mom! I’m ready for you to come back and help me paint the front door and install a new mail box! « Wordless Wednesday: It’s my birthday! oooh! i love it! its so so much better. and you guys installed it yourself?! amazing! LOVE your cubes behind the table, too!!!! I wouldn't even know where to start, I can't believe you installed all of that by yourselves! It looks great!! I love it! Great work! 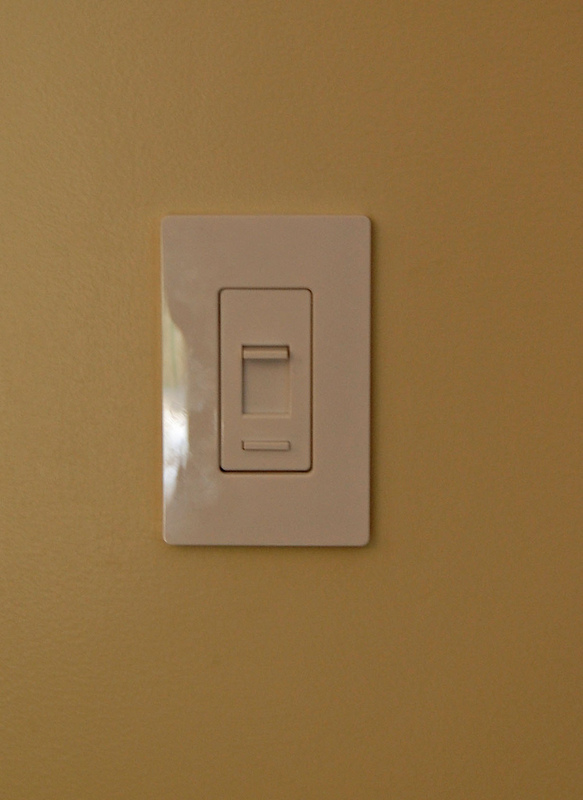 Dimmer switches are so handy.